This is one of my favorite outfits that I've worn recently mainly because of the length of the skirt. 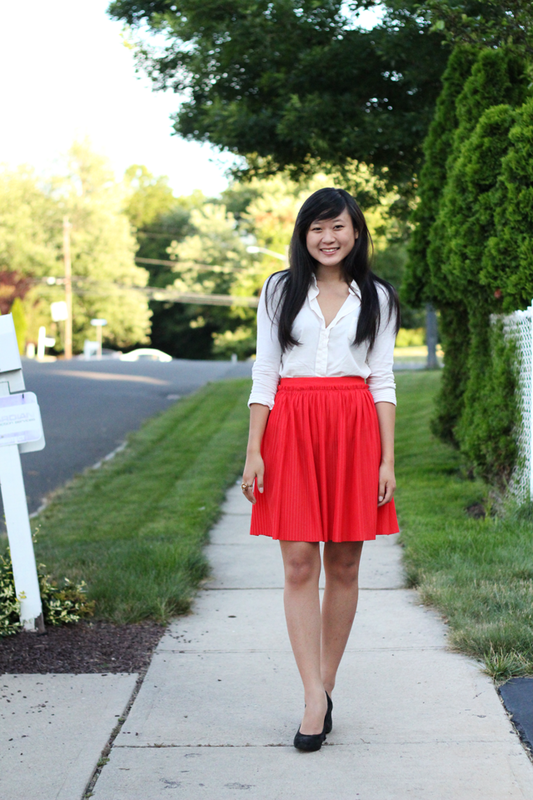 I've been loving longer skirts these days, especially since you get fewer sketchy glances from random men in the city. Plus, you can pass out on the train without the fear of accidentally flashing someone if you toss and turn. That's always a plus. Always. This is going to be my last outfit post before you start seeing my new bangs in my pictures. They're slowly growing on me...but very slowly. I just wish they would get longer faster. Blunt bangs are also a bang in the summer since I sweat a lot on my forehead (so attractive) and the bangs just make it worse. If you guys ever decide to go for blunt bangs, wait until the weather cools down so you don't melt in 100 degree weather! P.S. The length of the skirt is phenomenal, no? Saves us from many awkward situations :p! The color of the skirt is perfect on you! The length is adorable, as well. I need to find a skirt that length with that kind of flare. Love! 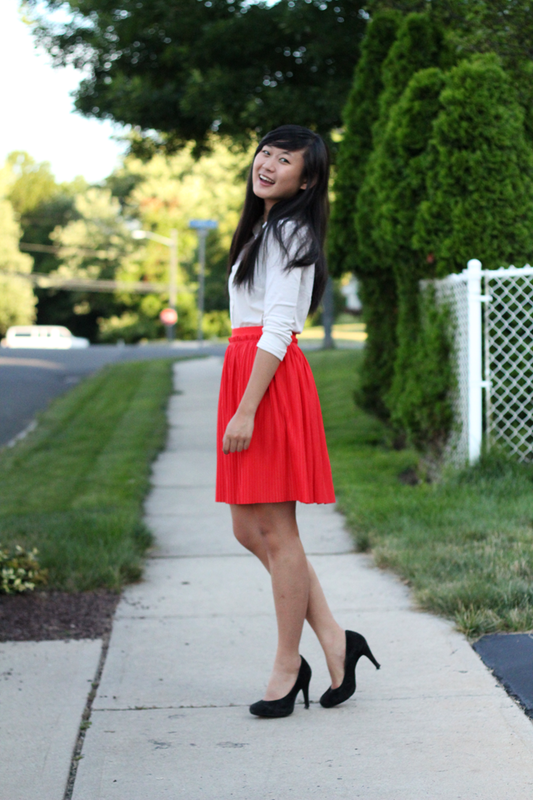 i'm still loving your blog and digging the length and cheery color of this lady-like skirt. your style is impeccable :) can't wait to see your bangs! I am in love with that skirt. It makes me happy that longer skirts are popular at the moment, because lately they have been so short, they are nearly impossible to wear, let alone be comfortable in! That might be the most adorable skirt ever. Pleats and ruffles and the most lovely color? Check, check, check. Loving the way you paired it with simple, wonderful neutrals. My blogging bestie is the prettiest! I want to hug you too! So friggin badly! I'm never letting you go when I land in NJ! I eyed that skirt at H&M too when I was last there! It's such a lovely color and I looooooved the pleating detail. Now that I have a job, I might just need to get it :) Can't wait to see the new hair! I would take KFC (or that super cheap Thai restaurant we stumbled upon in NYC) over overpriced food any day too. More money for clothes!! Ugh I seriously miss you too much. This is really your style! And I love it so much :) Love your skirt!! I appreciate your bright ideas in this ray ban 2132 article. Great work! Great resources of ray ban 3025!Thank you for sharing this with us.